June is Cataract Awareness Month. Cataract is a clouding of the eye’s naturally clear lens. Most cataracts appear with advancing age. The exact cause of cataract is unclear, but it may be the result of a lifetime of exposure to ultraviolet radiation contained in sunlight, or may be related to other lifestyle factors such as cigarette smoking, diet and alcohol consumption. According to the Vision Problems in the U.S. report from Prevent Blindness America, over half a million Missourians over the age of 40 suffer from cataract problems. It is the leading cause of blindness worldwide. Treatment of cataract involves removal of the clouded natural lens. 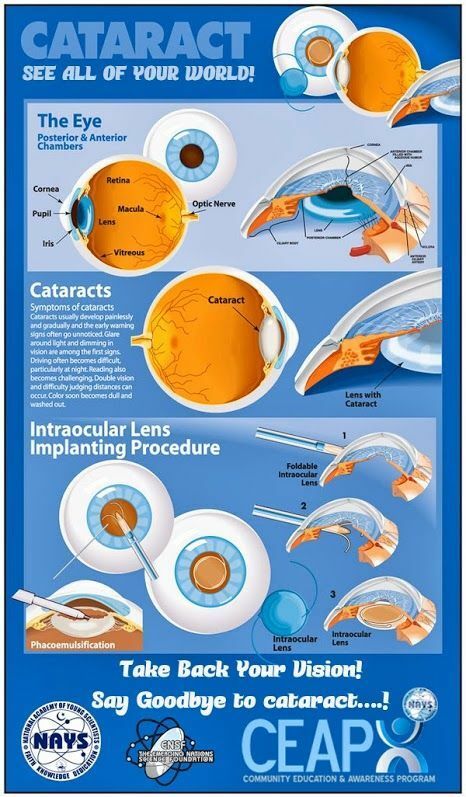 The lens is usually replaced with an artificial intraocular lens (IOL) implant. Cataract removal is now one of the most commonly performed surgical procedures with more than a million such surgeries performed each year. This entry was tagged blindness, blurred vision, Cataract, vision problems.